As a child, you probably never thought about the consequences of not brushing your teeth. What about flossing? That probably wasn’t too high on your radar either. Now that you’re a parent, you can guess that your children may feel the same way you did; however, you can change it. Instilling good dental habits in your children at an early age can do wonders for their future oral health. Haven’t scheduled your child’s first dental appointment? A family dentist explains what you can expect and the benefits of this initial visit. According to the American Dental Association (ADA), you should schedule your child’s first dental appointment by the time he or she is 3 years old. It is also beneficial to have them see a dentist by the time their first tooth emerges. While it may seem frivolous to visit the dentist when your child only has one or two teeth, it can be beneficial to the future of their oral health. During the initial visit, you and your child can expect a thorough, visual examination. The dentist will examine his or her mouth to look for any potential areas of concern, and if possible, your child’s teeth may be cleaned. As your child grows, a family dentist will watch to make sure everything is developing accordingly and will work with you and your child to ensure good oral habits are being practiced at home. 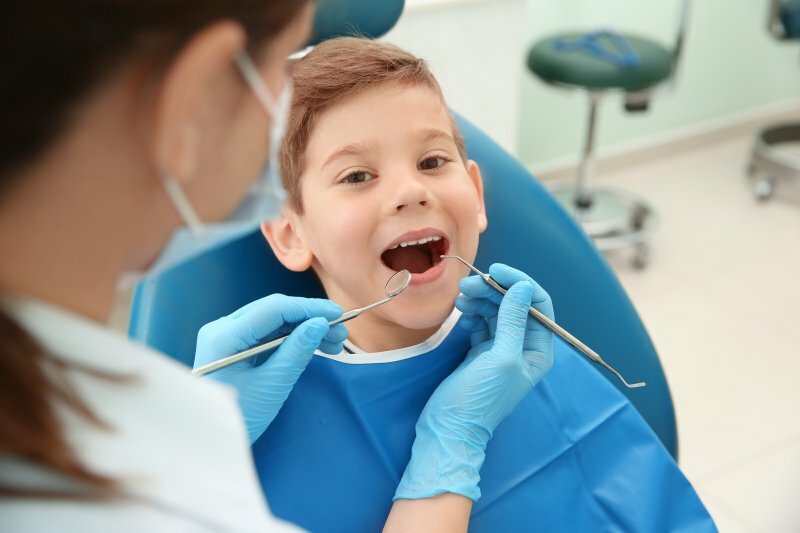 Since many children (and adults) often fear going to the dentist, this initial visit is important, so you can establish a relationship between your child and their dentist. This early exposure helps to generate a familiar face, lessening the chance of experiencing anxiety or fear when taking them to the dentist. What are the Benefits of Instilling Good Oral Habits in My Child? Limit the amount of sugar and carbohydrates they eat, as bacteria can feed and grow on teeth and around the gum line. This can lead to cavities or gingivitis. Monitor their morning and nighttime dental routine to make sure they are adhering to the 2x/day for 2-minutes rule. Schedule their dental visits every six months to ensure their teeth and gums are in good shape, and so that the dentist can address any problems in its early stages. Just because your child’s teeth aren’t permanent yet doesn’t mean they don’t deserve proper care and treatment. Your family dentist understands the importance of caring for baby teeth, so be sure to discuss any concerns you may have in helping your child care for their teeth and gums at home. At Dentistry at Windermere, we believe your children’s oral health is just as important as your own. Our team of dental experts enjoy treating your children, and we believe it is our goal to ensure every visit is fun and educational. As a fundamental part of our practice, we will work to safeguard your children’s teeth as they develop, providing insightful ways of teaching them good oral habits. To learn more about our children’s dentistry services, contact us via our website or call (770) 205-1212.